Two day turn around for a comp to show a potential customer for my client. The trick I have learned is to work the illustration in positive and then give them art reversed which allows the black things to read in the glass as dark...and the light stuff gets the texture and whiteness. If this goes, there are either 6 or 12 illustrations that will be needed lickety split. Hello another stream of income from illustration through the business. 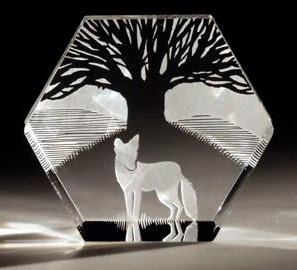 Plus, I am digging the treee and think that a piece with a bunch of trees at different planes in the glass might make a nice piece...R. thinks that this technique might suit an ice skater with NYC in the background (hello cash machine)--So, this might have some legs. We are going to get snow like no ones business tomorrow and Monday. The closings are being planned as we speak. K and I are making our traditional Christmas dog biscuits for fun.